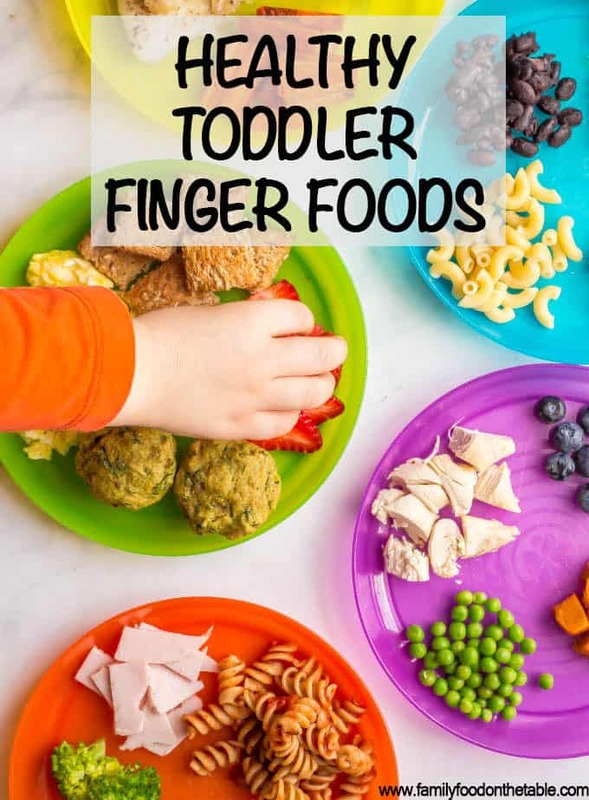 This collection of healthy toddler finger food ideas includes fruits, veggies, proteins, grains and dairy choices that are safe and appropriate for older babies and toddlers to eat at mealtimes. It also includes a free printable so you don’t get stuck in a rut with serving the same few foods! Welcome to the fun – and messy! 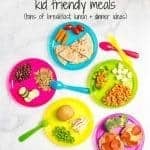 – world of toddler finger foods! 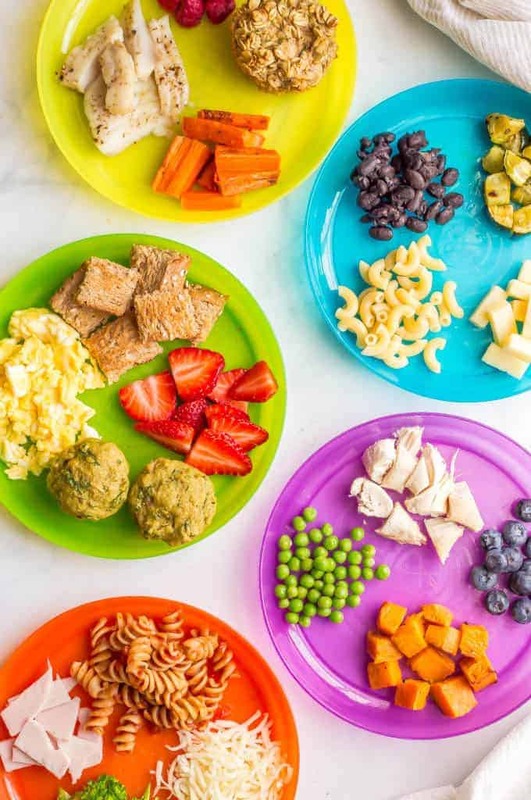 If you are just embarking on this, I have a ton of information and FAQs in my healthy baby and toddler finger foods post that you can check out. 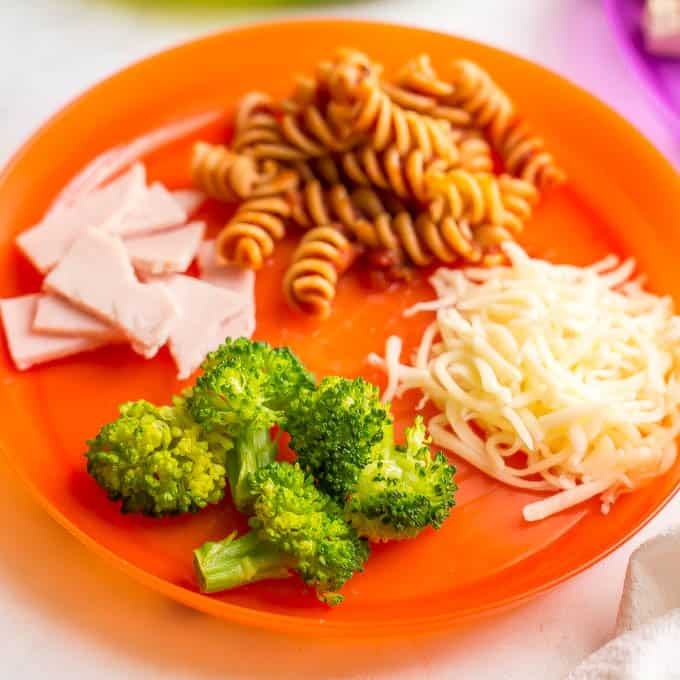 It’s all about how and when and what to offer as your child starts to try finger foods. 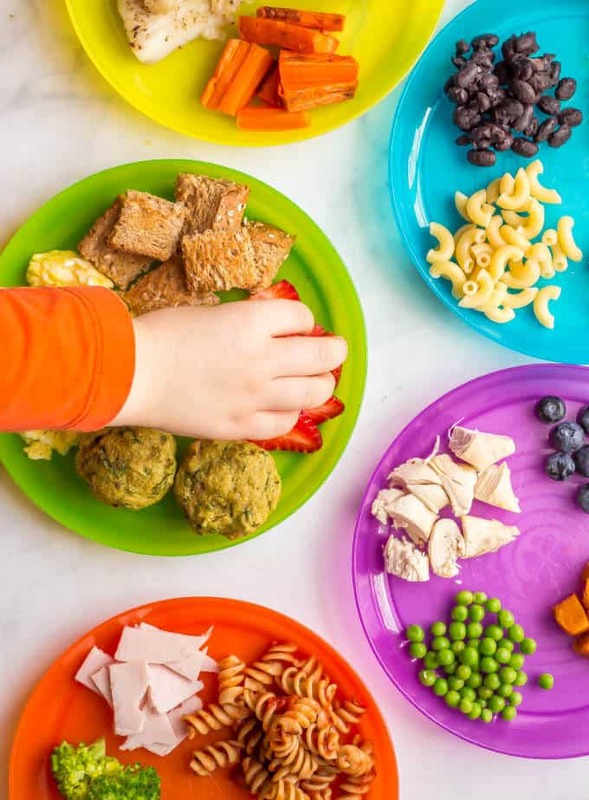 Today, though it’s all about the actual foods to offer and healthy choices to include to get your little one started on the right foot. If you’re like me though, you’ll quickly be hunting around for what else your child can try. What else to offer. What else to introduce that’s safe and healthy. Also, as a health and nutrition editor, I know it’s important to have plenty of variety. 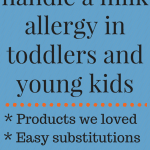 And to keep offering your toddler foods that they don’t seem interested in, to encourage them to try new things. That can be hard, and the tendency can be to give them only what they seem to be eating. But I didn’t want to fall into a rut of offering the same things every day. So I created this list and frequently turned back to it to help me pull in a fruit we hadn’t had in a while, or to offer a vegetable or grain I hadn’t made recently. It’s easy to forget these things when you’ve got a toddler on your hands and this list was a great reminder! Just as a note, most of these are non-recipe foods – simple ingredients, simply offered. Cause many days I know that’s all we have time to pull out, right? 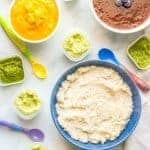 I’ve also included some of my favorite recipes for little ones, though, and you can always check out my toddler and kid food category for more ideas. 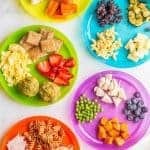 I hope this list of healthy toddler finger foods is helpful for you too and I’d love to hear in the comments below what your kids’ favorite foods are or whether there’s anything you’d add to this list. Here is the FREE PRINTABLE of all the ideas below! 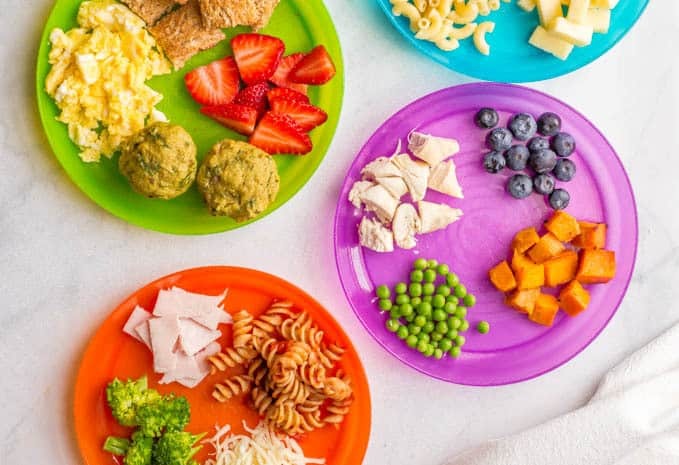 Check out these categories for some mostly ready-to-go finger foods and see below that for some easy recipes. Fruits should be soft (cooked, if needed, or very ripe otherwise) and able to be easily mushed or gummed in your child’s mouth. Remove peels and cut into small pieces or sticks for your child to pick up. If the fruit is slippery and your child has trouble grasping it, you can roll it in a “dusting” of crushed O cereal. You can also incorporate fruits into oatmeal, pancakes and muffins. Vegetables should be well-cooked and soft enough that they can be easily mushed or gummed in the mouth. Cut larger vegetables into small pieces or sticks. Introduce your baby and toddler to a variety of whole grains and try to limit the amount of processed grains they receive. Cooked grains, once cooled a bit, can be smushed together to create little clumps for your child to pick up. Melting in some cheese helps, too. Whole wheat pasta, cooked well and cut into small pieces. You can also mix pasta with tomato sauce or cheese or a veggie puree. 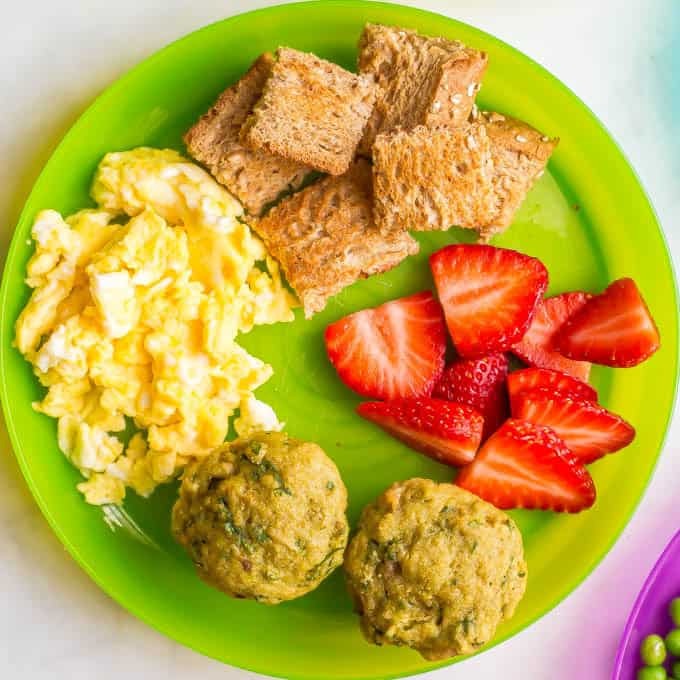 Whole wheat toast pieces – these are great served with a spread of applesauce, smashed avocado, peanut butter, melted cheese, or any fruit or vegetable puree (which is one of my favorite ways to use leftover baby foods). 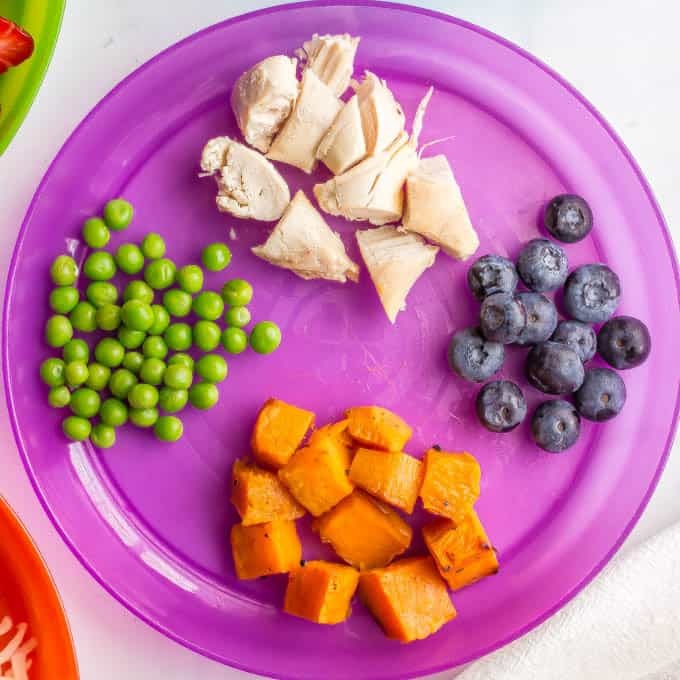 Active, growing toddlers need protein and they’ll get it from many sources (including their milk). Here are some protein ideas you can serve. Make sure everything is well cooked, soft and cut into appropriate sizes. Toddlers should continue to drink milk. Check with your pediatrician for the amount and type (such as whole versus 2%) for your child. Other dairy ideas are below. You can also incorporate cheese into quesadillas, eggs, pasta or make grilled cheese bites. WANT SOME RECIPES? Keep reading! 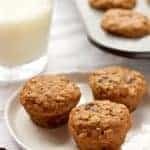 Check out ALL of my healthy muffin recipes here. And here’s that FREE PRINTABLE one more time! I’m so glad this is helpful! I hope you find some new yummy foods for your little one!